RRC BLOG: Best Gun Listing Ever! This is one of the funniest online gun ads I have ever seen. It was posted at 3:05 AM, so you know alcohol was at hand. Read the ad below. I have a one of a kind Sig Sauer built Glock 40 imported by Beretta and Colt, distributed by ATI. It shoots really big .40 cal 785 grain bullets that have absolutely no recoil. (don't ask me how they do it.) The gun is absolutely BRAND NEW (we are on Back Pages no?) with just 2000 or more rounds down the pipe. 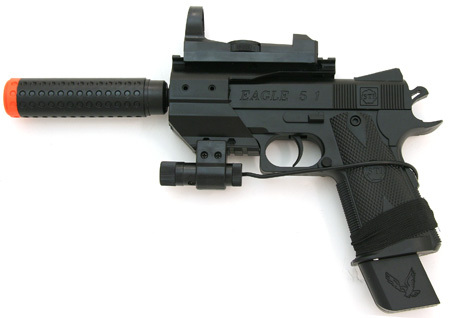 It comes with nuclear powered night sights because tritium is so yesterday. The gun has had a trigger job, barrel job, flared ejection port, it was even cleaned with compressed air so i guess you can even say it had a ---- job. I had the magazine well beveled for easier insertion... I need to talk to the wife and the gunsmith about that. The trigger is ab fab... No stacking, no creep, no take up, no over travel. It breaks cleanly every time at 3.5 lbs. And if i ahve said it once i have said it a million times... I do not exaggerate. The reset is not to be believed. There is no safety on the gun because it is biometrically tuned to the owners' biorhythms. It will only fire when it senses you are practicing at a range, in the desert or scared s$&@4?!'s. BTW, did I mention it is small enough to conceal in an eyeglass case? Yet you can wrap all your fingers around the stocks. It only comes with one magazine because it holds unlimited ammo. Unfortunately and this is really the only problem with this gun is it doesn't come with any clips. Sorry. It has almost every type of mod that can be made... I even sent it to Fiji or Tonga, cuz I heard there was a shaman there who specialized in these type of guns. Anyway I will let it go, even though this is gonna break my heart for the low, low price of $19999999 or best offer but please no low ballers. But hey... you save the tax and nics check fee. If your CCW is after July 1, 2011 I'll take $30 bucks off... See I am reasonable.